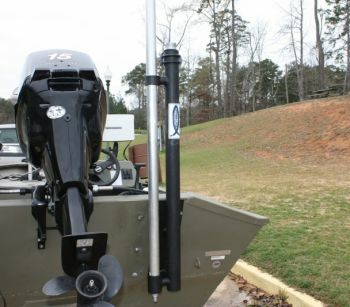 An economically priced manual pole anchoring system for anchoring boats. Our standard unit is for attaching to stern of aluminum or fiberglass boats. (Fiberglass installation may vary). Units can be built to each individual application. All units can be extended in 6 ft increments with purchase of extra poles. Unit is equipped with storage bracket attached to accommodate a six foot extension pole, as shown above. Extension poles work well in shallow water as push poles. Complete units are priced at $195 plus shipping and handling. Unit includes one 3 foot and one 6 foot aluminum pole section for a combined pole length of 9 feet, locking device, bolts and unit. All units are powder-coat painted black, sage green, desert sand or brown. With our customers in mind and rising costs of shipping we have an Internet Value Pack to save on shipping of added accessories. The value pack includes unit bracket, one 3ft pointed pole end, three 6ft aluminum pole sections, locking device & bolts. Truck rod carrier and other accessories coming soon. Custom applications other than transom mounts welcome to fit every boater's design. Works well on pontoon boats. For other applications and pricing, please call. All boat applications are available whether as stock items or custom designs.